You may be planning a family holiday to France this year and will want to make sure everybody is entertained during your stay. There are numerous attractions for families throughout France ranging from theme parks, amusement parks, zoological parks and tree top adventure parks. Here are just some of our suggestions for keeping children young and old occupied during your holiday to France. This amusement park near Beauvais North of Paris is fantastic value and a great day out if you are on a family holiday in France. The best bit is that the Parc Saint Paul is only 2 hours from Calais. Stay at a wonderful family-friendly chateau bed and breakfast North of Paris and you can make a fun-packed family short break in the area. The amusement park has 39 attractions so there’s fun for all the family here. Try out the mini quads, toboggan slide, pedalos, the haunted castle and the carousel as well as bumper cars, a roller coaster and the ‘extreme fall tower’. The park is open every day in July and August and weekends in June and September. 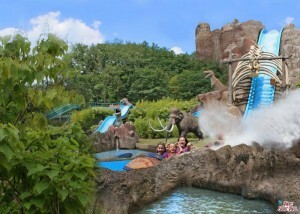 Parc Asterix is one of the top family attractions in the Paris area. The amusement park offers an action-packed combination of attractions an d shows which will appeal to the whole family. If your children are over 1m tall they will have a blast at Parc Asterix. All of the rides and attractions are on the theme of the Gallo-Romans with Obelix and Asterix being the stars, of course. There are numerous attractions for the older thrill-seeker such as rollercoasters and the giant Discobélix. But there are also plenty of attractions for the younger visitor. 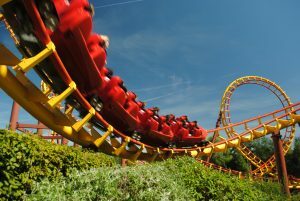 Plan a full day out at Parc Asterix on your family holiday to France. The amusement park is open every day from June to the beginning of September, during French school holidays in October and at weekends during September and October. You can see ticket prices on this link. This award winning historical theme park in the Vendée area of Western France is guaranteed to provide you with a memorable experience on your family holiday to France. The winner of the Tripadvisor Travellers’ Choice award in 2013 in the ‘Attractions’ category, it will captivate not only children of all ages but adults too. Renowned for its live spectacles, the costumes, drama, effects, tricks, atmosphere are all breathtakingly brilliant. There is just so much to see and do, including a Viking long boat, a huge gladiator battle, dancing falcons and a battle of the keep re-enactment. The highlight is the Cinéscénie show each evening, which features more than 1,000 actors and hundreds of fireworks. Just wow! 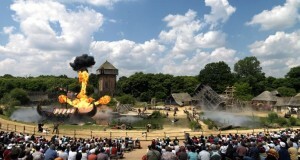 You can view the opening dates and times for the Puy du Fou amusement park here. If your family would rather visit an animal park than a theme park then the Domaine de la Bourbansais just South of Saint Malo in Brittany is my recommendation. This is not a zoo. The animals here are all part of an ongoing educational and research project aimed at increasing populations of animals at risk. In addition to the animals that you will see in a natural habitat, don’t miss the falconry display with flights by falcons, eagles, owls, vultures, buzzards and other birds of prey. The running of the hounds is also a fantastic sight to see. 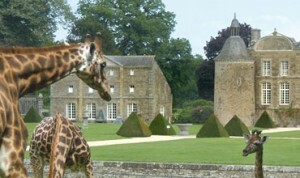 A great day out for the animal loving family in the grounds of a beautiful chateau. You can see the opening times and entry fees for the Domaine de la Bourbansais on this link. Consider also a visit to the Grand Aquarium de Saint Malo and Cobac Parc. 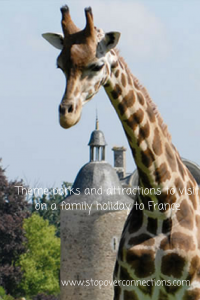 There are of course thousands of other attractions that will keep you entertained on a family holiday to France. Look out for more in future blog posts.